On Fridays at 365 Less Things I share my favourite web finds of the week. I hope you will enjoy them as much as I did. We’ve discussed minimalism in decorating, but not everyone here is a minimalist. Here are two decorators’ take on the style. This post about a family of four camping out of a Prius really spoke to me. We camp several times a year, and I’ve insisted that our van is a necessary component to success. Maybe not. Zen Habits has 15 tips for decluttering that are great. On the front page of her blog, Gretchen Rubin has written 5 Tips for Resisting Impulse Shopping. Sounds good to me! Declutter an area where your items may have spilled over into someones else’s space. For example ~ Your clothes in your husbands side of the closet. 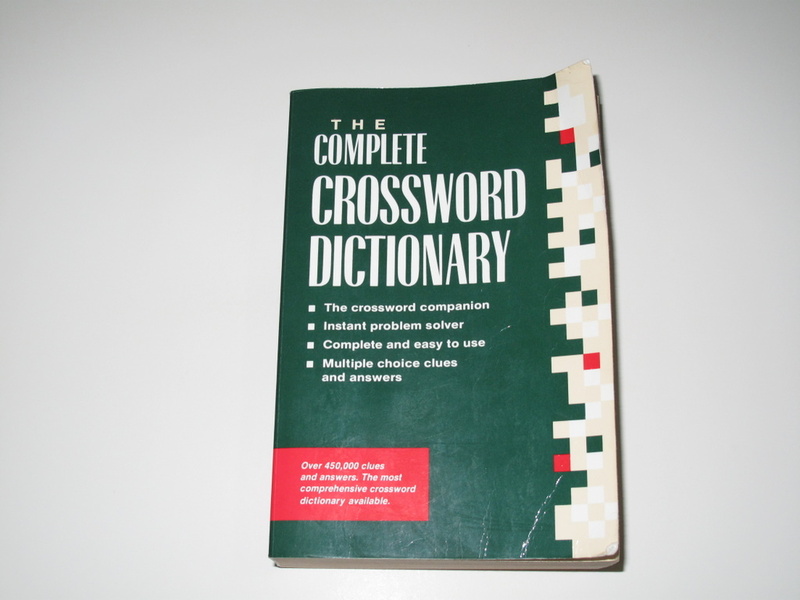 Before sending this crossword dictionary off to the thrift store I had asked my dad if he would like it because his copy of the same book was getting very tatty. He said no as he didn’t mind his tatty and beside he had a lot of extra info written in the margins of his. So guess what? 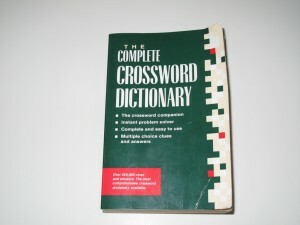 He called me the other day asking if I still had it because his had fallen apart. Too late dad that window of opportunity was already closed. I had already decluttered this book ahead of my scheduled vacation and he was about a week or two late. « Guest Post ~ Do you need more storage or less clutter? Those are some interesting links. I especially like the first one on style and the one on camping. I think that I am not a minimalist in decorating style but I am more one has as little as possible with just a hint here and there of art and personality. I can’t camp, but people are always uncomfortable with the idea that I can use one carry-on for a trip of any length. They don’t understand it at all and it actually seems to bother them. great links as always. I loved the family camping article – I really need a proper camping vacation soon again. its been a year since I slept in a tent. best thing about camping is that you are outside 24/7 and suddenly a small flat with running water and heating is pure luxury. it reminds you to reshuffle your perspective once in a while. I liked the decorating article – I think I would like something inbetween Terry’s and Cindy’s ideas, but if I had to choose, then Terry’s. I could live in the Ashley Milnes and the contemporary lounge. But I don’t think my kids or pets could live there too though. So true, how often I have wanted something, and gotten really hung up on it, but a couple of weeks later have totally lost interest. Would love to know the scientific or psychological explanation of what goes on in my head at those times. Of course, since I’ve been decluttering, its no use bringing things into the house, because then I just have to turn around and get rid of them again! Well the good news is that I don’t acquire things. Was in a shop with a friend the other day and saw an aquaintance looking at matini glasses. I had been pondering what to do with the set of matini glasses that were only used once, and so I waltzed up and offered her mind. That’s what we call FreeCycling Old Skool Style! PS there was no shop assistant involved so nobody missed out. That should read “I don’t acquire things any more. Too much hassle to get rid of them. I loved the Zen Habits No. 13 item where he says ‘hoarding is a selfish act’. (I believe, because items could be passed on to do someone else some good/service). Interesting…I should keep that in mind more often. I’ve often thought my front doorway could tell a story if it could talk!!! I figure EVERY ITEM in my home has come in through that doorway. I sometimes wonder if it had been possible to have a camera above the front door recording at all times, what a film that would make! Put that film on fast forward and WOW that would be such an eye opener. Since I started this journey very little has come in, apart from food and hygiene items. Also, when we take it that next step, how do the purchases leave? Well, apart from me taking my excess to Charity shops, all either goes to my garden/compost, into the rubbish bin or to be pretty honest/gross, down the sewer via the toilet. I think you have it all in hand. ‘Front Door Movie’ just imagine the fun to be had watching that. ‘FRONT DOOR MOVIE’, well that is just tooo cute!!!! 🙂 I’d be yelling for someone to eventually TURN OFF the light (why do we leave them on?). Love the ‘lots of bags leaving’!!!! Yahoo to you girl, you go! You rock! In my movie you would actually see other people bringing things. especially my mother. but then I force her to take my stuff with her to dispose (no car, no recycling center) and to do whatever she pleases, because it was hers in the beginning. I often wonder how many possessions one has during the lifetime. I mean from childhood til dearth, including clothes, books, shoes, kitchen items, toys, electronic devices (I think this is my ninth mobile phone and wont be the last), furniture, pens, lighters (!)etc. the number must be somewhere in the hundred thousands if not more. and then in reverse, how many owners does an item have in its lifetime. like my couch has had 4 owners before me, and moved quite a lot. I guess that goes from a bra (I dont think they even change owner twice) to a lighter (my rough estimate is 50)… sad, you will never know. OK I’m going to put my hand up and say I HATE camping. My hubby’s idea of camping is whatever you can carry on your back and do it as hard as possible. Even camping in a tent isn’t really my thing unless there are no alternatives possible. We do own a family size tent and all the doo-dads, but I leave that up to hubby to give the kids that experience. Our son is 17 and probably won’t come with us on holiday again ie makes his own plans these days, our older daughter isn’t into camping either – where do you plug in the hair straighteners? Only our youngest will still oblige her dad, and even then she’ll only go if he promises to take the tent. hahahaha God I love it when people are honest! I don’t hate camping but it’s not my go to either. If I was stranded for whatever reason then yes I will make camp with whatever, but I don’t go into the countryside hoping to rise to a higher place cos I’m close to nature. To be honest I don’t like getting too close to nature, it itches hahaha. Where I live nature is right there with me, Godzilla and Rastus remind me of that so often!! Having said that I have had enough experiences with camping to realise that if I could meet the inventor of the comfy bed I would hail him or her with deep gratitude. Carry on campers I’ll boil the kettle and make coffee in the kitchen thanks!! I’m not into camping either: only been twice in my life and both disasters. I have a suggestion for a mini decluttering mission. Yesterday while decluttering in the laundry room, I decided to pull out our washing machine and undo the hot and cold water hoses. Anyhow, the little screens inside the hoses were completed clogged with grit and sand, and the rubber washers were shot. I can’t believe the washer could work at all like that. I replaced all four rubber washers, cleaned the little screens, and completely cleaned behind and underneath the machine. Yuck! But now the washing machine is working great again. as I am not sure what you are actually talking about (english is not my mother language) and as my washing mashine is so heavy I could never ever clean underneath it, I will just ignore this, even though I am convinced it could use some further investigation. but once I start on the washing machine, I will have to take out the fridge and the oven next to it too. and to be honest I am just afraid of how much “ewwwwww” there will be.